North Korea’s sixth and most powerful nuclear test to date involved a massive bomb, which coupled with recent missile developments, has the potential to devastate a city. North Korea tested a possible staged thermonuclear device earlier this month, with early official yield estimates ranging from 50 kilotons to 150 kilotons, several times larger than the atomic bomb dropped on Hiroshima, Japan. Drawing conclusions from the seismic data from the blast, the explosive yield could be as high as 250 kilotons, analysis by Frank V. Pabian, Joseph S. Bermudez Jr. and Jack Liu, researchers with 38 North, an independent research site run by the U.S.-Korea Institute at the Johns Hopkins School of Advanced International Studies, introduced. The test caused landslides around the Punggye-ri Nuclear Test Site, where 38 North researchers previously detected extensive tunneling, predicting that the North could test a bomb with an explosive yield of 282 kilotons. Other analysts have encouraged readers to be skeptical of the latest 38 North report, noting that while the estimates may be accurate, the method is wrong. There is a possibility the yield could be even higher, possibly in excess of 300 kilotons given the potential depth of the nuclear test, which viciously rocked Mount Mantap. The North intends to mount its new nuclear device, which it claims is a hydrogen bomb, on its Hwasong-14 intercontinental ballistic missile, a weapon that can reach parts, if not most, of the continental U.S.
To understand the difference in explosive power, consider what a 250-kiloton nuclear weapon could do to a major city compared to a 120-kiloton bomb, one of the initial yield estimates. 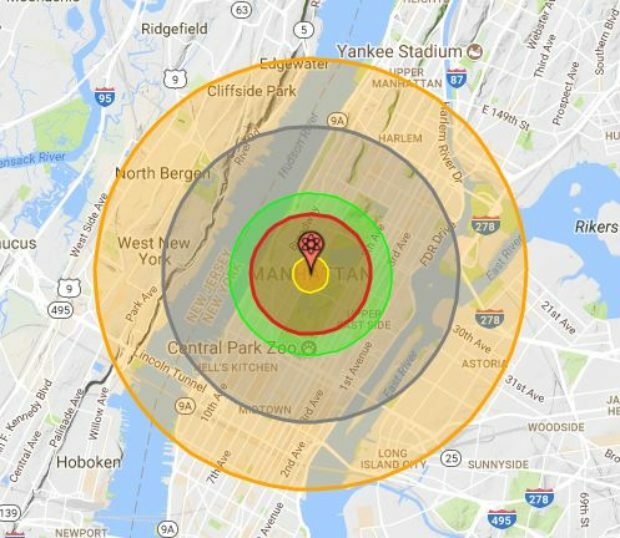 NUKEMAP, created by Alex Wellerstein, a respected nuclear historian, allows users to see the impact of a nuclear blast on any city anywhere in the world. The casualty numbers are, according to the creator, evocative, not definitive. 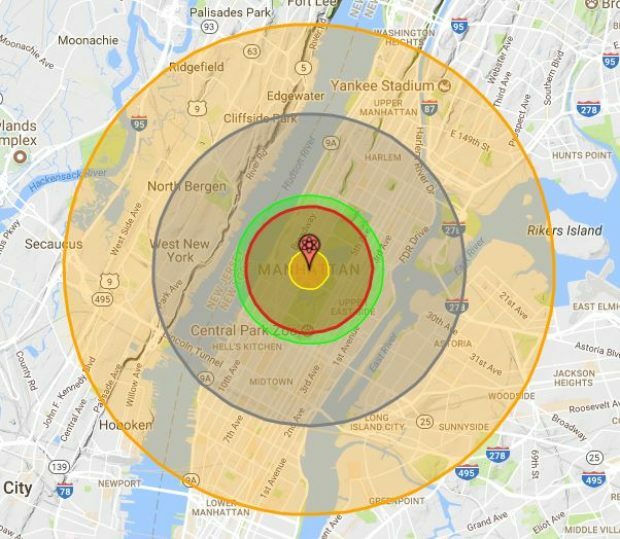 Using this useful tool, it is possible to visualize the impact of a North Korean nuclear blast in Manhattan. South Korea has detected radioactive gas from the most recent test, but the military has not yet determined whether North Korea tested an actual hydrogen bomb. The Pentagon has not made its findings public. Leaked information related to the most recent nuclear test suggested the American intelligence community suspects the bomb had an explosive yield of 150 kilotons, but those assessments may have since been updated. The governments of South Korea, Japan, and the U.S. erred on the side of caution, putting the explosive yield estimates at or below 160 kilotons, but some independent scholars and analysts have arrived at even higher figures. Yield estimates are calculated in several different ways, and given that the seismic data reports vary, different countries and scholars have arrived at very different conclusions. “It doesn’t matter whether it was 130 kilotons or 200 kilotons. It can destroy a city. The missiles now being tested can reach the United States,” Cheryl Rofer, a chemist and nuclear weapons expert argued recently. “The bottom line is that the North Korean nuclear and missile capability is real,” she added.